Nanami Momozono, a high school student, is kicked out of the apartment she shares with her father, because he left town to avoid his gambling debts. Later, Nanami saves a strange man named Mikage, so he generously offers her his home. Nanami later discovers that Mikage has tricked her into taking his job as the tochigami (local god) of the Mikage Shrine. To make matters worse, Nanami is in love with her head shinshi (or familiar), Tomoe, a fox yokai who hates humans. As Kamisama Kiss, Vol. 24 (Chapters 138 to 143) opens, the body of the terrible yokai, Akura-oh, resides on the Mountain of Flames... empty. Why? Akura-oh's soul has moved on. Now, Yatori, the mysterious yokai who is obsessed with Akura-oh, decides that he will reside in his idol's body! Tomoe might have mixed feelings about his former friend, Akura-oh, but he won't let a terrible creature like Yatori take the body, even if it means that he himself will have do take residence in it. Later, Nanami and Tomoe make plans for a future after the Mikage Shrine. Where does that leave her other shinshi, Mizuki? THE LOWDOWN: The Kamisama Kiss manga continues to be a highly imaginative shojo fantasy manga. There have been very few volumes that did not meet my high expectations. I am a big fan of this powerfully dramatic series, which makes the best of its primary genres: shojo romance, yokai fantasy, and supernatural drama. Kamisama Kiss Volume 24 is an excellent graphic novel. It is one of those superb volumes that pay off for readers that have stuck around for the long, good-reads haul. Once again, creator Julietta Suzuki shows her narrative strengths, weaving a poignant run of chapters that plays with the best of supernatural romance and yokai fantasy. This time, the angle is as much real world as it is supernatural worlds. In a sense, Nanami and Tomoe are facing the reality of growing up and that means leaving the magic of childhood behind – the Mikage Shrine? Dear readers, I want you to enjoy this genuinely magical manga, Kamisama Kiss, so give it a try. 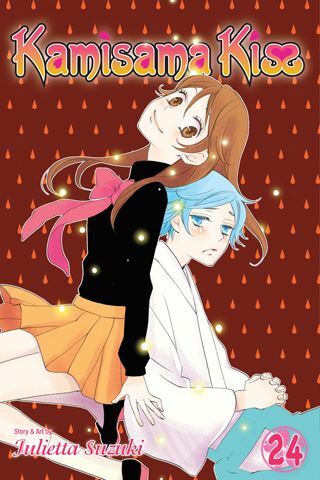 I READS YOU RECOMMENDS: Fans of fantasy and yokai-themed manga will want to try the Shojo Beat title, Kamisama Kiss.